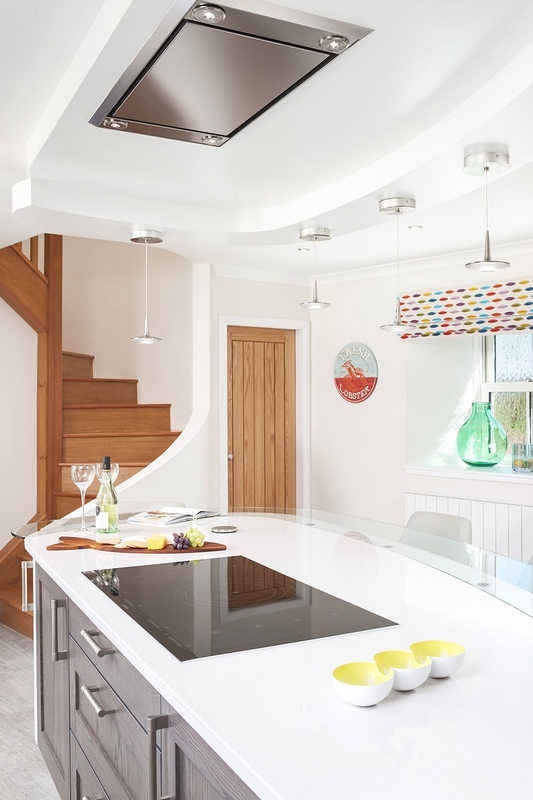 Nestled amid the striking landscape of the Renfrewshire countryside, a few miles from the village of Lochwinnoch, sits the fabulous home of Jo & Brian McCulloch and their daughter Laura. It’s easy to see why this beautiful spot captivated the couple when they bought here 18 years ago. 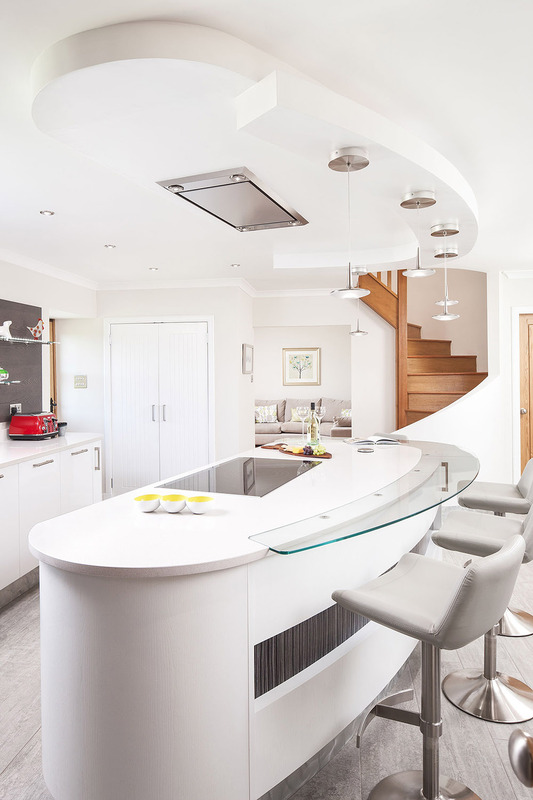 To give the our clients the sense of light that they craved, the design featured a mixture of Fusion pure white and Mode grained painted pure white with contrasting sections of anthracite shaker oak furniture with Zebrano cornicing from Stoneham. 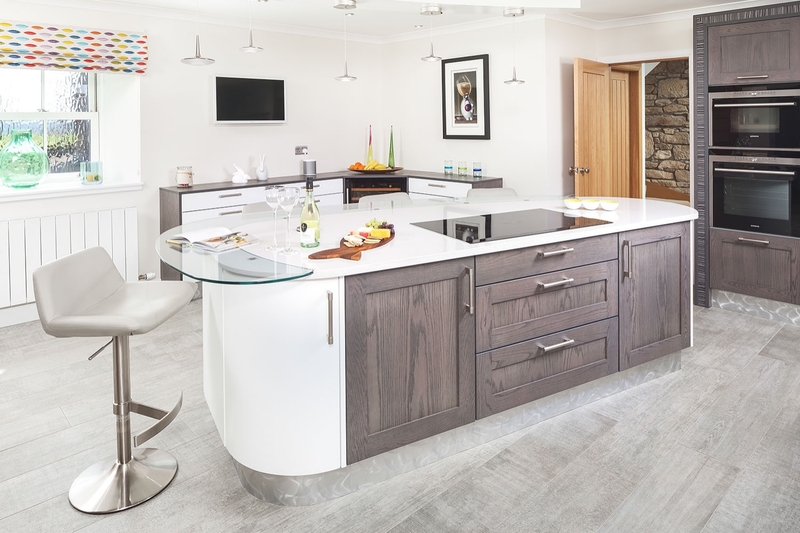 To maximise the space in the room, a beautiful bespoke oval shaped island with an inset contrasting Zebrano panel, finished with a brushed steel plinth was included. The design also features a complementary bulkhead to mirror the island design with integrated extraction and LED lighting. 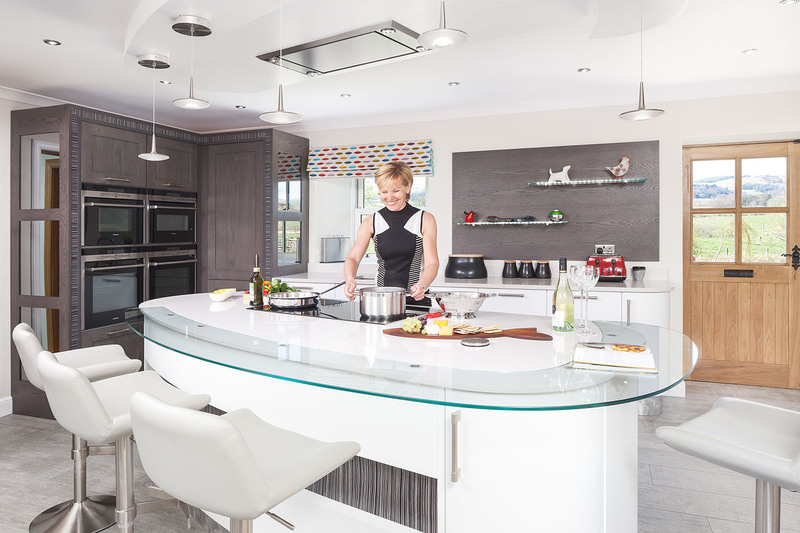 Our clients are keen cooks and entertainers two large multifunction ovens, a steam oven and microware were included in the tall housings. 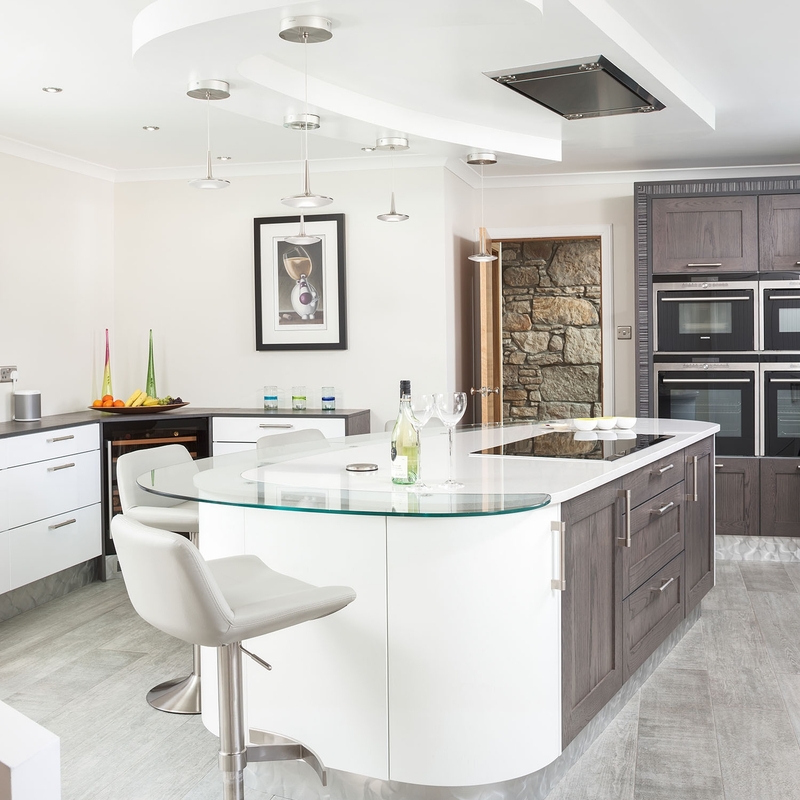 The island is home to a 90cm Flex Induction hob from siemens, allowing the chef to interact with family and friends while cooking. Careful consideration was given to the layout of the kitchen, it was important that the kitchen functioned well ergonomically and that cooking utensils, pots and pans and spices were easily accessible from the cooking zone. “We love the oval island and the sense of space. 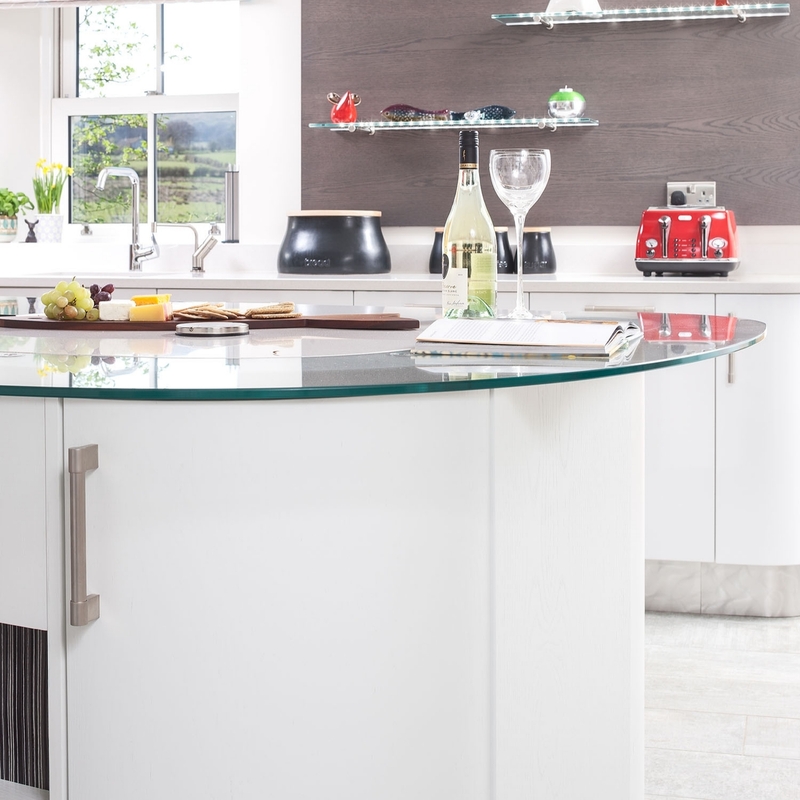 In our previous kitchen we had an island and a separate table, but the beauty of this large island is that it performs both functions and is a very sociable arrangement where your friends can sit and chat”.